High in vitamin C. No added sugar - contains naturally occurring sugars. Low calorie. No artificial colourings, flavours or sweeteners. Suitable for vegetarians, vegans and coeliacs.Rayner's PLj has been exciting taste buds for decades with its naturally sharp taste. As always, PLj Lime can be used just like fresh lime juice. Never drink undiluted. Dilute to taste. We recommend a dilution of at least four parts water to one part PLj. Approximately 20 x 25ml servings per bottle. There are so many ways to use PLj. The ultimate wake me up, PLj Lime and ice-cold water adds a zing to your morning. A dash of lime in your healthy lunchtime smoothie and you're set for the day. Mix with sparkling water and cucumber pieces for a thirst quenching afternoon refresher. As the evening unwinds, you can add PLj Lime to so many of your evening drinks to help finish off your day. 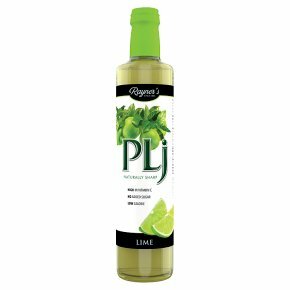 Not just a refreshing drink, PLj Lime gives your cooking a lift. Use as an instant salad dressing, in the perfect lime cheesecake or for an authentic Mexican feast. In the kitchen, PLj Lime hits the spot.